Abstract: The continuous decline of coral reef throughout the world due to anthropogenic activities has encouraged the development of different mitigation strategies, many of which involve the creation of artificial reefs or the transplantation of corals onto impacted reefs. Both of these strategies involve the need for source corals for the mitigation, as the natural recruitment and growth of coral larvae into adult colonies displaces lost ecological services for too great a period. In Hawaii, where corals grow only a few centimeters a year, this issue is pronounced. Hawaii’s Division of Aquatic Resources (DAR) has introduced an innovative strategy to source coral material from boat harbors by removing coral colonies from man-made structures within the harbors, thereby minimizing the impact to wild colonies while selecting coral colonies that have already shown to be resistant to higher SSTs, sewage discharges, pollutants, sedimentation and survival under these dynamic conditions. 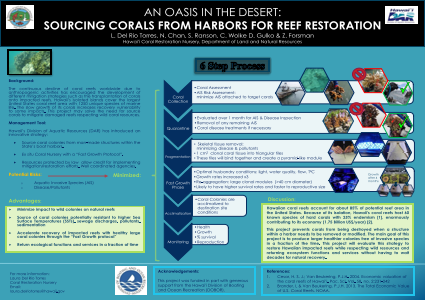 Such corals may be one answer to improve rehabilitation success on deteriorated reefs. Harvested corals are fragmented down into small fragments and grown out with an exceptional fast growth rate under high maintenance conditions; once they reach an optimal larger size they are re-aggregated into adult colonies which are then transplanted onto natural degraded coral reefs.